Visit Audi Devon for a New or Certified Audi in the Greater Philadelphia area. Test drive an Audi today! Audi Devon is one of the premier car dealerships in the Philadelphia area, and we are committed to customer service and satisfaction. Audi Devon is conveniently located in Devon PA and serves Philadelphia, West Chester, and Wynnewood with an exceptional selection of new, used and certified pre-owned cars for sale. Experience our dealership in person and meet our friendly sales team who will assist you in finding the perfect Audi, or give us a call. If you want a stylish, reliable, fun-to-drive new vehicle, plan a visit to our Devon showroom and explore our entire new 2017 & 2018 Audi inventory firsthand. Among drivers' personal favorites are the A4, Q5, A6, S5 and A7. The all new 2017 Audi Q7 is the newest addition, so don't forget to check it out as well. Only a few minutes with the brand's signature comforts and advanced, in-car connectivity technologies have proven long enough to convert even the most skeptical drivers into loyal enthusiasts for Audi models. There are many reasons for opting to buy a used Audi rather than a new one. Perhaps the most important is the used car lower price, registration costs, and insurance rates. That said, not all used cars are created equal. Audi Devon promises nothing but the highest quality used Audi for sale for drivers in the greater Philadelphia area. We carry a great selection of luxury used and certified pre-owned Audi vehicles. We take the time to go over each model in our inventory inch by inch, ensuring each used car that leaves our lot runs like new for a very long time to come. Visit Audi Devon today at 222 West Lancaster Avenue Devon, Pa. 19333 and see the difference for yourself. We promise you'll leave with a better opinion of used cars and used car salespeople. The financial experts at Audi Devon near Philadelphia are available to answer your questions regarding car loans and leases. Have a question about interest rates, loan terms, or programs for individuals with bad credit, or no credit at all? Call us and get the answers you need in regards to any of our Audi finance services. At Audi Devon we'll help you get car financing quickly so you can go about your busy schedule in your new vehicle. For truly helpful assistance in securing a car loan in Devon, visit us today! In addition to helping car buyers find the car of their dreams, and fighting on their behalf for agreeable financing terms, Audi Devon performs routine auto repairs in Main Line Philly with painstaking perfection. Each member of our team is chosen for their passion for, and knowledge of Audi models, offering the invaluable peace of mind of knowing that when your car is in our state-of-the art shop, we'll always treat it like our own. Prefer to take on auto repairs yourself? No problem. Audi Devon, located at 222 W. Lancaster Avenue Devon, PA, 19333, fully supports do-it-yourself types and offers the certified Audi car parts you need to do the job right, and can trust to last for a long time to come. To order the car parts you need, simply swing by or complete our online order form. If, perchance, we don't have the part you're looking for, we're happy to order it A.S.A.P. Feel free to contact Audi Devon today at 888-482-0395 if you have any questions or if you'd like to schedule a service appointment now. We look forward to meeting you soon and serving you for many more years to come! Audi Devon is one of the premier car dealerships in the Philadelphia area, and we are committed to customer service and satisfaction. Audi Devon is conveniently located in Devon PA and serves Philadelphia, Malvern, and Wynnewood with an exceptional selection of new, used and certified pre-owned cars for sale. Experience our dealership in person and meet our friendly sales team who will assist you in finding the perfect Audi, or give us a call. 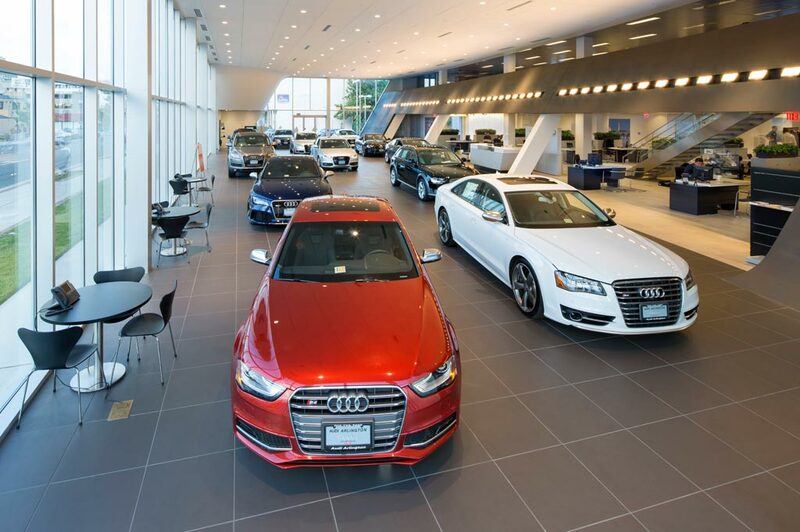 If you want a stylish, reliable, fun-to-drive new vehicle, plan a visit to our Devon showroom and explore our entire new 2018 & 2019 Audi inventory firsthand. Among drivers' personal favorites are the A4, Q5, A6, S5 and A7. The all new 2019 Audi Q7 is the newest addition, so don't forget to check it out as well. Only a few minutes with the brand's signature comforts and advanced, in-car connectivity technologies have proven long enough to convert even the most skeptical drivers into loyal enthusiasts for Audi models.